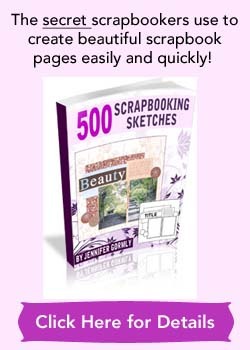 Scrapbooking for Beginners is a compilation of articles, scrapbook videos and short how-to-scrapbook tips that’s written to help newbies get started, easily and quickly. If you’re not aware (which is unlikely), scrapbooking is growing big… huge in fact. Each day, more and more beginners are jumping into the fascinating and dizzying world of scrapbooking. With digital cameras and technology getting more advanced and commonplace, taking thousands of photos become a reality for many of us. And many want to find a way to record their stories, preserve their memories, and have a slice of the scrapping fun too. Enter scrapbooking. But for a beginner, scrapbooking can seem very exciting and…overwhelming at first glance. With the endless rows and aisles of scrapbook supplies lining up the scrapbook stores, and scrapbook layouts that seemed to burst with colors, embellishments and whatsnots, it’s not hard to understand why. Push all that aside for now. Let’s get focused for a few minutes. Follow the steps below to get the “big picture” of what scrapbooking is about. New to scrapbooking? Let’s look at the basic makeup of general scrapbooking layouts. By knowing the common elements that make up a scrapbook page, you’ll know what to expect and how to work with them. After you learned the basic makeup of a scrapbook page, you’ll want to learn the steps to creating a scrapbook page and the function of different elements. After you’ve created a bunch of scrapbook pages and put them into a scrapbook album, you’ll have a scrapbook! Read about my little scrapbook process and see how I put together a scrapbook layout from start to finish. 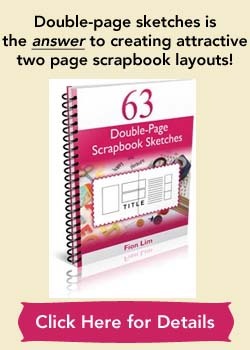 By now, you’re likely to have a good grasp as to what a scrapbook layout is made up of, how different page elements support a scrapbook page, and the step-by-step process to making a scrapbook page. In about 7 minutes, June Campbell will demonstrate step-by-step to creating a scrapbook page, from start to finish. For more information on sorting your photos, cropping of photos and what kind of scrapbook supplies to get you started, review this beginner scrapbooking section. Take your time, I’ll be waiting for you here. I hope this compilation of Scrapbooking for Beginners articles and videos have given you the needed information to start on your scrapping journey! Ready to learn about the basic design principles, the basics of cardstocks, the basics of patterned papers, how to choose colors, how to add page titles, how to choose embellishments and how to add ribbon to your scrapbook pages? Then don’t miss Free Scrapbook Layout Ideas. Be sure to explore other informative articles on this website for more ideas and inspiration! Welcome to scrapbooking and have fun! And if you’re looking for scrapbook supplies but don’t know where to start, click here. Thanks for the help! I have been wanting to make a scrapbook for a long time and I like how you told me everything that I need to know just for the beginning. I’m glad I got to see this to help me out! I received a lot of scrapbooking supplies, from albums, clear plastic sheets, cardboard stock cards of various sizes, and plenty of embellishments. I would be considered a beginner, can you point me in the right direction?